Rhodes is the largest of the Dodecanese islands and the easternmost of the major islands of Greece in the Aegean Sea. It lies between the Greek mainland and the Island of Cyprus. Rhodes in Greece is the capital of the District of the Dodecanese. Historically, Rhodes was famous for its Colossus of Rhodes, one of the seven wonders of the ancient world. And today, Rhodes is a major tourist attraction with its sunny beaches and ancient heritage sites. The island boasts of 300+ sunny days in a year and it is officially the sunniest place in Europe. The main air gateway is the Diagoras International Airport in Paradisi, which is located at about 14 kms to the southwest of Rhodes Town. There are regular flights from Athens and chartered aircrafts that connect Rhodes to all the major cities of Europe. 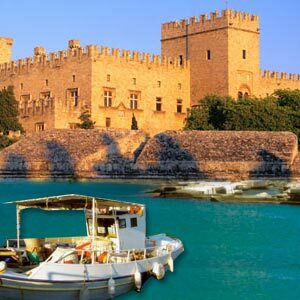 You can also go to Rhodes via a ferry from any of the Greek Islands or Turkey. You can also travel to Rhodes in one of the many Cruises. There are plenty of public buses which ply throughout the islands. The main bus terminal in Rhodes city is at the New market, where you may buy tickets at the various booths. You can also hire a taxi from the airport or your hotel to travel around. The taxis are dark blue in color with white roofs. You can also rent a car at the airport or via your hotel or at any local car rentals. Motor bikes and mopeds are popular alternatives to cars. Rhodes offers a wide range of accommodation options, from luxury hotels to small pensions. You can also rent a studio, villa or a flat, either in the town center or near the sea or in the interiors of the island. Full boards (boarding and lodging), half boards (very similar to bed and breakfast establishments) and pensions in the heart of the ancient town are also good places to stay in. You may also hire a boat of any size and make it your own floating home. Rhodes is one of the sunniest places in Europe. The average temperature in summer ranges from 24 ? 33 degrees centigrade and in winter, the temperature is between 8 ? 15 degrees centigrade. Light cotton clothes are preferable. Don?t forget your hat and your sunglasses and use sunscreen liberally. Always carry plenty of bottled water with you and stop as soon as you feel tired and rest in a shady and cool place to recuperate yourself. With a 250 km long coastline, Rhodes boasts of a number of beaches catering to the interests of various categories of people. From the rocky beaches of the north western coast to the sandy ones in the south of the island; from the quiet inlets for the families to those that host eternal beach parties, Rhodes has it all. You can sail or windsurf, ride on water bikes and scooters or practice snorkeling and diving. Lindos (Rhodes town): This is a stunningly beautiful and trendy beach on the bay. Kalithea: This is a very pleasant spot but can be crowded. It houses a spa and a number of beaches with their own tavernas. Faliraki: A long, sandy beach with plenty of tavernas. There are a host of activities including jet skiing. You can also find a nudist beach further south. Ladiko beach (Anthony Quinn Bay): This is a very scenic spot with a small beach on one side of the bay and a platform for sunbathing on the other side. The nightlife of Rhodes is well known all over Greece. You can spend your evenings in one of the many coffee houses and clubs scattered all over the island. You get to meet tourists of ever nationality and age spending their nights in the coffee houses, where music of any and every kind is played ? from rock to pop, from disco to Greek music. You can also watch the Sound and Lights show highlighting the history of the island. Tourists also spend their nights in the Buzouki clubs which offer live Greek music. If you get bored of all the partying, then head straight to the casino and try your luck on the tables and slot machines. Archaeological Museum: This museum houses many archaeological finds of significant importance. You can also find a wide collection of epitaphs dating back to the post-classic, Hellenist, Roman and the Knights of St John?s period. You can also see two reproductions of Aphrodite and a wide collection of urns and vases. Museum of Decoration Art: This building houses a very fine collection of ceramics, fabrics and carpets, pieces of carved wood, embroideries, tools, traditional costumes and pieces of furniture. Museum of Byzantine Art: The virgin of the Castle Church, one of the major buildings of the old town, houses the Byzantine Museum. It was built in the 11th century A.D, and was the Byzantine cathedral of Rhodes which was later turned into the Roman Catholic cathedral. Contemporary Art Center and St. Apostles Church: This belongs to the 15th century and collects old maps, plans and historical prints describing the Aegean Sea and the Dodecanese. Rodini Park: This Park claims to be the first landscaped park in the world. One can take a leisurely walk here and also see a part of the ancient aqua duct system of Rhodes within it. Lindos Acropolis: No visit to Rhodes is complete without visiting Lindos. Lindos is at a distance of 55kms from Rhodes town. It was built in the 12th century B.C. The Acropolis of Lindos, just over the village, is accessible only by foot. It houses the Doric Temple of Athena. The village contains many houses with Grecian architecture and decoration dating from the 16th century. The village has perfectly preserved its medieval character, with pebble covered streets and whitewashed houses. Filerimos Hill: This is a site of medieval remains with a monastery and chapel. It offers a good view of the northern island. Valley of Butterflies: This place offers a sanctuary to a number of colorful butterflies. Epta piges (Seven springs): You can have a look at the seven springs and there is a short walking trail also.